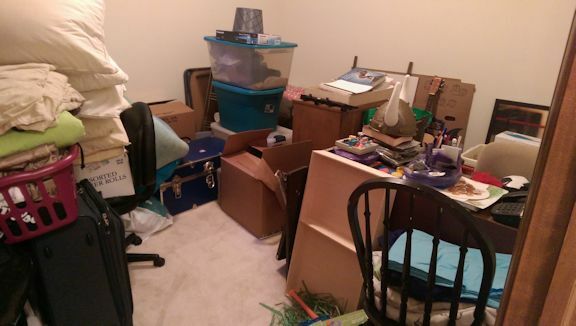 It all seemed so harmless at first—some old Halloween costumes in the closet, and a small desk that I moved from the children’s study area because my son had outgrown it while my daughter could still use it. As the years went by, junk got put on the desk, around the desk, and in other parts of the room. The closet ended up full of old linens and old clothes. Then my kids graduated from college and put all the stuff they brought home in that room. At that point the closet became unusable, with boxes and suitcases and lots of other things blocking the doors. Instead of dealing with it at that time, I put off the chore, thinking I’d wait until my daughter moved out. But she is still here, along with all her stuff, and doesn’t yet have a definite move-out date. So this week I decided to start working on that room a little at a time. Because the small desk was the catalyst for all the mess, getting rid of it first seemed appropriate. I also disposed of two worn-out desk chairs and moved some stuff that wasn’t junk away from the closet doors. Then I opened the closet and got a strong whiff of mildew. The culprit turned out to be a pair of my son’s wrestling shoes from high school. Ew! Thankfully, my husband volunteered to bag up those moldering shoes and take them out to the trash can. To show my appreciation, I got some tasty steaks for dinner and made sure he was well fed!